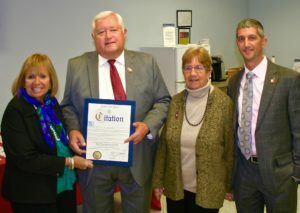 Supervisor Carpenter presented the citation at a recent Open House at Retlif Headquarters in Ronkonkoma NY. Left to right: Islip Town Supervisor Angie Carpenter; Walter Poggi: Marilyn Poggi: Scott Poggi. In part the proclaimation read: “Retlif Testing Laboratories, founded in 1978 by Walter and Marilyn Poggi, has for over forty years provided field leading electromagnetic compatibility solutions, rising to become a globally recognized independent testing expert relied upon for aerospace & avionics, commercial aviation, rail & transit, maritime, military, homeland security, medical, and transportation applications in the areas of EMC/EMI, environmental simulation, lighting and composites.